With over 200 million users, Duolingo is the top dog of the language-learning apps. Thanks to its effective curriculum, clean design, and appealing gamification, the app has been able to stay dominant on the market. We have studied the Duolingo's success factors, found its drawbacks and estimated an MVP for a similar app. Read the article to learn more. When Duolingo first saw the world, global mobile education market volume was at 3.4 billion US dollars annually. It was a promising industry, and its volume has grown more than 4.5x times by 2017 to $16.2 billion. 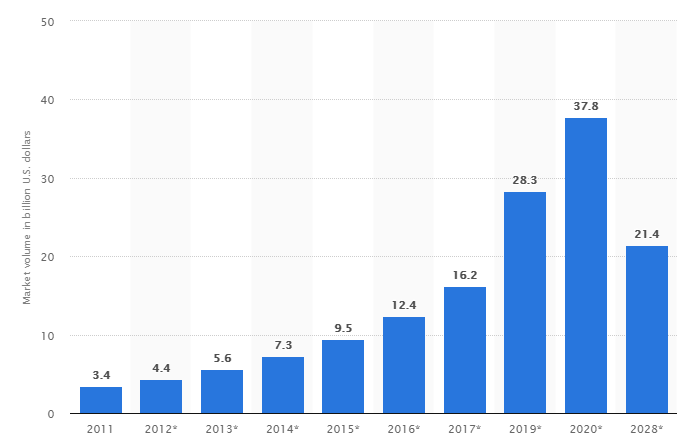 According to Statista.com, these numbers will reach 37.8 billion by 2020. The point is, mobile education is thriving and it is not too late to get on the bandwagon even if you haven’t really considered making anything even remotely close to such a piece of software. As for Duolingo, it is one of the most popular apps (currently #1 in App Store and #2 in Google Play in “education” sections) that helps over 200 million users learn more than 30 different languages. It also has a desktop version, but it is out of the scope of this article. Duolingo has been on the market for 7 years now and has earned a 4.7 stars rating on AppStore and Play Market, in addition to praise from the press. In this article, we will try to figure out what has made this app stand out from the crowd. Obviously, it will be hard to repeat its way on the path to glory in 2018, but using the best practices of the industry leaders never hurts. 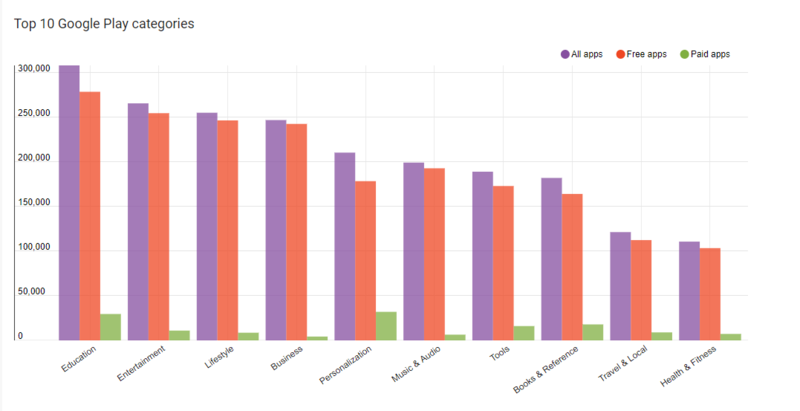 In this article we will tell you about why would anyone need to develop such an app (if all those scaling billions on the graph above didn’t persuade you), who were the people who got Duolingo to its current state, which features were the most important (spoiler alert - it is gamification), how long does it take to build those features and more. AppBrain claims that the total number of educational apps in Google Play exceeds 300,000 and that is more than the number of apps in any other category, including entertainment, lifestyle and business applications. It was pretty obvious back in late 2000’s that creating a useful app can potentially bring you fame, money and everything one could dream of (it still can). It all started back in the end 2009 of when Luis von Ahn, a professor at Carnegie Mellon University, and Severin Hacker, his graduate student, began the development of an app with the help of several other people. Luis was raised in Guatemala and knew too well that in order to learn English, his compatriots had to spend too much money. His aim was to give people a product that would allow them to learn languages for free. There are plenty of good things one can to say about Duolingo. After analyzing plenty of reviews by users and critics we have a more or less firm understanding of the pros and cons of the app. Almost every review begins with how wonderfully designed Duolingo is. Even those that try to make Duolingo look like a waste of time admit that design is actually not the reason they dislike the app. 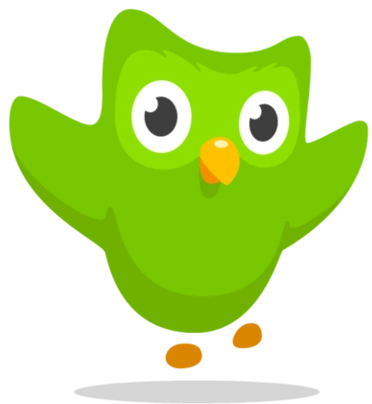 Besides, Duolingo mascot looks adorable. Duolingo CEO knows that learning a language is a social process. That is why they’ve launched Duolingo Language Club in the beginning of 2017. That is an optional social component to the language learning experience. The clubs are available for both iOS and Android versions of the software. You can have a competition within your family or social group. People who aren’t keen on socializing are able to find something for themselves in Duolingo as well. You can “communicate” with bots in the iOS version of an app. Chatbots can maintain a conversation for you to practice your speaking skills. It seems like a great way to improve the ability to chat with real people by practicing on the machines. For now, the function of communicating with bots is being relaunched and they are not available at the moment. There are several research papers that prove that the app is helpful in studying languages. It is a scientific fact - one is able to learn a language with Duolingo. It takes time for new projects to earn so much respect, but in the end, it is totally worth it. It is available on the Web, desktop, iOS, Android and even Windows Phone. This is the feature that made the software so popular. Let’s speak of it in details after listing disadvantages of an app. Who would gladly tell you about app developers’ flaws? Their direct competitors, of course. We have looked through several reviews and here are the disadvantages that were noticed in Duolingo app. Personalization is one of the biggest trends in E-learning. A one-size-fits-all approach is no longer relevant (if it ever was). 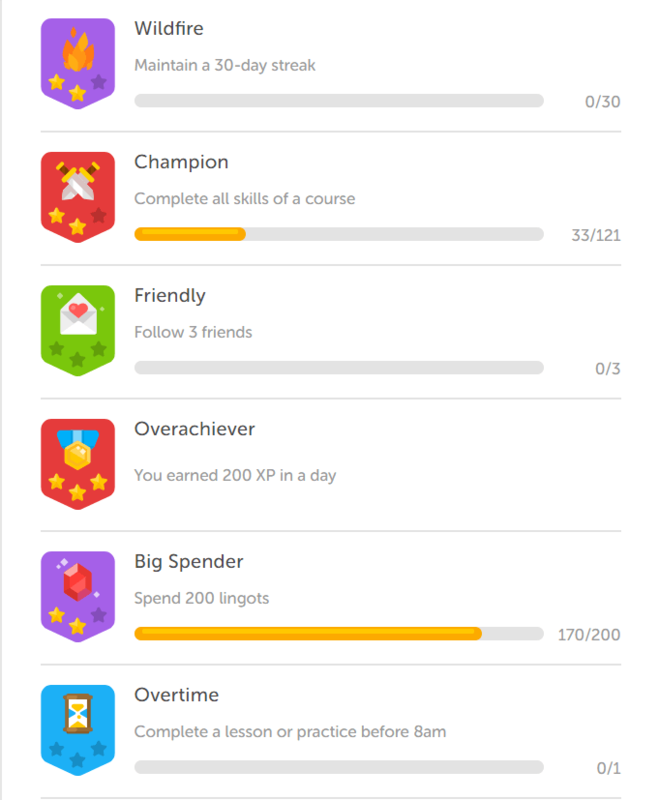 Duolingo doesn’t personalize the language learning experience enough according to user’s goals or proficiency level. It also won’t teach you accents, or tell of any cultural peculiarities of language. While Duolingo has speaking exercises and has voice recognition function, sometimes its assessments are lacking. Plenty of eLearning platforms allow you to interact with other people. They will gladly assess your pronunciation and will tell you the correct direction to move to. One could find many other potential mistakes of Duolingo team. However, very few people would say that the app is boring or dull. Most of the people who have tried to learn languages using Duolingo were amazed by how addictive they become to it. What can we say? If you want to build an app as successful as Duolingo, it has to be engaging as hell. Let’s speak of that in the next section of an article. Anna Fitzpatrick, a writer from Toronto was by no chance IN NEED to study a foreign language. In her Duolingo recommendation letter for the New York Times, she admits that she got tired of looking through her old acquaintances’ Facebook pages and decided to learn Dutch instead. Have you ever felt awful for endlessly scrolling your Instagram news feed and liking other people’s photos till 3 AM instead of doing something more or less useful? I bet you did! Learning a new language won’t give you that feeling of guilt. "The app eventually became a type of productive therapy, replacing other time-wasters in my life"
She especially enjoyed measuring her progress in terms of winning points, completing levels and outdoing her friends. Zan Gilani, associate product manager at Duolingo admits that well-built gamification definitely contributed big time to the international success of the company. Certainly, they A/B tested the app like crazy and continue to adjust it thoroughly. They’ve come up with several different user-engaging techniques, including non-monetary in-app currency called lingots as some sort of loyalty points and daily rewards for completing the required sets of exercises. Duolingo team constantly works on user experience enhancement, though it is already as addictive as Instagram, some users claim. First of all, Duolingo is a course-based application. Leaving aside all the fancy gamification, social aspects and other stuff that contribute, it is nothing but a set of exercises. The learning program includes speaking and listening exercises. There are also course parts that require from user making a translation or choosing the correct answer from multiple options. This is a simple (and more or less standard) set of exercises that can be outsourced to the companies that develop eLearning software. From the technical standpoint, such an app would require a good voice recognition system to be able to assess the correctness of your pronunciation. Some people find the voices in Duolingo a little bit robotic and even irritating. As this is an eLearning application, building a great course is vital for the future success of the software. “Tap the match” exercises (combining pairs of words from different languages). Gamification is a core component of Duolingo app. It is implemented in different forms. First of all, there are lingots - local currency. They can be used to purchase bonus lessons or cosmetic items for a mascot. Besides, there are leaderboards, badges, challenges and day streaks to earn bonus points. Unfortunately, lingots can’t be converted into real currency or withdrawn, or course. They add to a super engaging learning process, though. Besides, all the achievements you’ve earned are saved in the profile. There you can also change your avatar and have a look at your positions on the leaderboards. The app also has animation and sound effects - once you complete a task, you hear the celebration pipes, and a mascot owl appears to praise you. One needs a good system of point accumulation for user experience to remain engaging. Users are able to found or join a social club to communicate and compete with friends, family members or other social groups. Different customized features are available here as well - choosing the emblem and the name of the club, for instance. In our view, it wouldn’t hurt to link the app with social networks to brag about the success in studying languages. This function is omitted in Duolingo. Duolingo just won’t let you go. It would remind you that you have a course to complete if you abandon the app for a day or two. It contributes to the motivation sector of an app by reminding users how lazy they’ve been recently. Duolingo doesn’t require a stable Internet connection from the user at all times. One is able to complete the courses even in a military bunker if the set of exercises is pre-downloaded. The function is very handy for those who spend many hours in the Wi-Fi-less subway or elsewhere without an Internet connection and with a smartphone in their hands. Duolingo developers react to the feedback from their more than 200 million user audience rapidly. They gather it via Reddit and some other places on the Internet. They also have a form within the app for people to leave their comments. This is a useful feature for those who are planning to gather feedback. There are many ways for eLearning apps monetization. 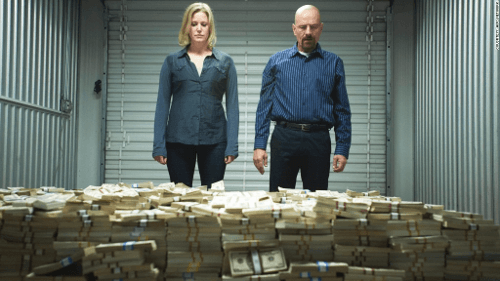 Those include advertising, affiliate management, selling data and many others. As for Duolingo, it was “lucky” enough to get sponsorship from Luis von Ahn's MacArthur fellowship and a National Science Foundation grant. Then it received extra funding from investments of Union Square Ventures and Ashton Kutcher's firm, A-Grade Investments. Duolingo users used to worry about the financial well-being of the app, so company’s CEO had to make not one but two posts explaining to users that they shouldn't worry - the app will remain free for users. "...our challenge is to find a way to make hundreds of thousands of dollars per day while still letting anybody who wants to learn to do so entirely for free"
Claiming that running ads has been an industry standard and reassuring users that they try hard for ads to be unobtrusive and non-disturbing to users, Duolingo management uses Google Ad Network now. The ads are shown at the end of lessons. The user can watch more ads to get extra in-app currency. The blog post by von Ahn says that this is by far the largest source of making money for this app. As some people can’t stand seeing ads, they have a subscription that allows avoiding any advertisement within the application. The subscription also used to give access to offline lessons, but now they are available for all the users. What’s important here, all these changes never touched actual learning content. A year ago, the support of Duolingo cost over $60,000 per day and the numbers were rising. The cost of developing and supporting an MVP e-Learning app is way smaller. Once again, to get a more precise quote, contact us here. How Long Does It Take to Develop Such an App? You might be discouraged by the immense number of money and effort one has to put into such a project like Duolingo app. Have no fear, after doing all the calculations, you can assess whether you are ready to have your own educational app built. 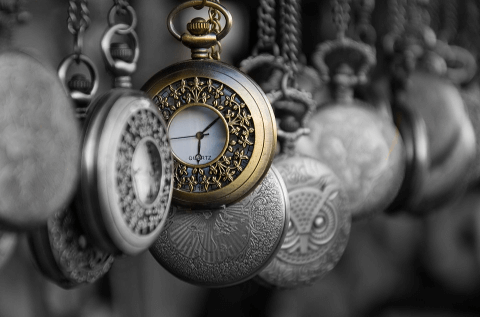 This section includes our estimations on how long does it usually take to build certain components or implement this or that feature into an eLearning app. It is based on our experience with e-learning app development. We have asked our developers to assess how much of their time it would take to build a custom solution like Duolingo. The numbers that will come up below are very rough, but they should give you an idea. For the sake of simplification, the estimations are made for an iOS platform. Android app development takes about the same time, give or take. We are not taking into account the testing and promotion of an app here. Rough estimation suggests that it would take 516 to 712 working hours to go through all of these stages. At the completion of this stage, the app will be structured, designed and ready for implementing the main functions (more on that in Stage 2 sections). As you can see, it only takes a couple of work weeks to get the app to this stage of development. Main functions implementation takes significantly more time. There are plenty of aspects. That is why the minimal and the maximal estimations have 130-hours-differential. Once again, those numbers are approximate. However, you can see the proportions of time-consuming operations. We’ve estimated the time for the app stabilization and debugging at 70 to 100 hours. Every case is individual. We can’t tell you the exact quote in this article. However, you can see the time estimations for building a potentially popular learning app. That should give you an understanding of the cost and time involved. 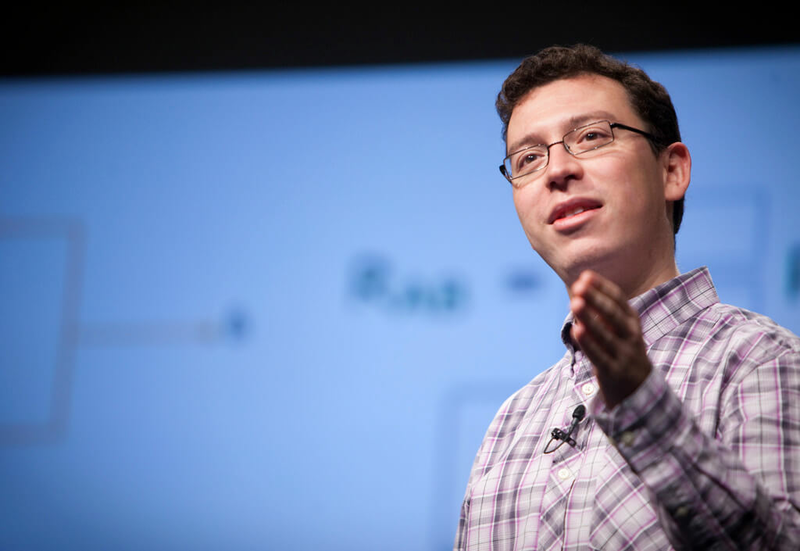 Luis von Ahn was trying to change the landscape of a modern education and make it free. 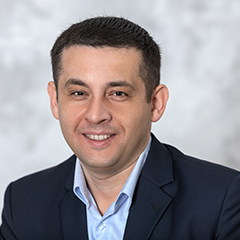 He succeeded in that with one of the most popular applications for studying foreign languages. However, it is very important to remember that even the most popular educational apps aren’t perfect but have features that are standard for the industry. In this article, we had a look at some of the features and tried to assess them. We also gave some time estimation for developing these features. In order to start with some of his/her own project in that industry, one doesn’t have to copy all the features of a successful app. Following some of the general guidelines never hurts, though. I've been leading a department specializing in eLearning applications for 14 years. The goods will start arriving in your mailbox soon. Use the form below to describe the project and get back to you within 1 business day. be up to date with our blogposts!